If you’re a big fan of the outdoors, you’ll know the weather is a fickle friend. Whether it’s scorching sunshine, whistling wind or driving rain, the elements can make it tricky to be outside. That is unless you’re prepared for the ride. With a sturdy outdoor canopy, conditions are always right for an al fresco event. They come in a huge range of shapes and sizes. So, it’s important to do your research. If ease of use is a key goal, for example, read pop up canopies reviews to find the best products. This article offers advice on finding the finest outdoor canopy for every occasion. The classic pop up canopy is great for families, as it requires no assembly. It is designed to, literally, pop out of the housing and spring into an upright position. While you can pick up a canopy of this kind for a budget price, it’s worth spending more to get a strong frame. If possible opts for a product with powder coated steel poles. The biggest priority for a beach canopy is wind resistance. You need a shelter that is very sturdy, so look for a fool proof stake or peg system. The poles should be long enough to penetrate deep into the sand. While most beach canopies are open sided, it’s worth considering a product with walls. They provide significantly more UV protection. Portable canopies are easy to shop for because they come in a broad variety of shapes. The best product for you depends on where you plan to erect it. However, if portability is a key requirement, don’t forget to look at weight. Plenty of canopies are small enough to fit into a rucksack, but you may need to compromise on overall size. If you know the weather will be turbulent, you need a canopy with as much protection as possible. Look for shelters with three walls and a sharply sloping roof. Pay attention to roof shape. The best products resist and direct water away from the tent area. Waterproof fabric is a must, as are durable, double sewn seams. Generally speaking, wet weather canopies are a good choice for windy conditions too. However, if your environment is very particular – for example, you’re setting up at higher altitudes – you may need special features. The strongest canopies are those with a higher number of poles that intersect. This increases stability and wind resistance. You can use all kind of canopies for tailgating events. It’s a good idea, however, to pick one which matches the terrain and weather conditions in your environment. The classic ‘top only’ canopy is quick to erect, but it can get wobbly in the wind. Certainly, if you plan to enjoy food in the open air, a shelter with netting or side panels is advised. Camping shelters are easy to find, but it can be tricky to pick the right one. The first consideration is size. It needs to be comfortable for your family, while also being lightweight and portable. 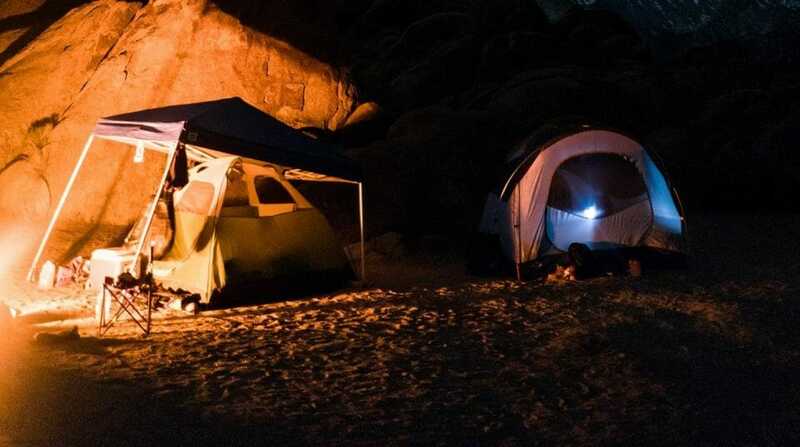 Depending on the weather, you may want a canopy that clips right on to your camping tent. It’s a good way to ensure wind and rain stays outside. If you’re looking for shelter from the sun, in a backyard or other mild environment, a no nonsense product is all you need. Make sure the pegs or stakes are sturdy, of course, but the key feature is UV protection. Walls may be unnecessary but look for a roof that slopes downwards at the front. It will offer maximum protection from the sun, all day long. When size and comfort are more pressing than portability, there’s a lot of choice on the market. Oversized garden canopies can be pricey, but they are perfect for garden gatherings. The best family shelters have broad dimensions and narrow, tucked in pegs that do not act as a trip hazard. It’s easy to forget businesses use portable shelters for all kinds of events including trade fairs, roadshows and product launches. If you need a canopy for a corporate function, the best choices are partially closed. Pick a two or three walled tent to safeguard the staff and merchandise inside. For the same reason, the roof and all seams must be tightly waterproofed. If you’re not sure where to start, it might help to write down the features most important for your environment or event. For instance, if you’re setting up on the beach, protection from the wind and the sun is vital. If you’re planning a backyard barbeque, think about how you’ll protect the food and have enough room to move and manoeuvre. When you’ve identified these key features, you can start to read reviews and pick out the most popular and highly rated products.